Fashionable pansy print nylon microfibre with chocolate leather trim. Flap top closure with magnetic snap lock. Leather trim handle and pockets. Large padded microfiber change mat. PVC zip top wet purse. 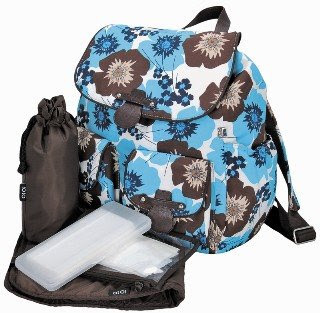 This backpack diaper bag is what made OiOi famous! OiOi Sophisticated Baby bags are the brainchild of Lisa Bennetts. More than 10 years ago she gave birth to a beautiful baby girl, Isabella, who gave her the inspiration to create a label that empowered mothers to have the confidence to look amazing and feel equally as good! With a wealth of experience in fashion and accessories product development and international marketing, working with companies such as Swarovksi Jewellery in UK and Europe and Oroton Australia, the birth of Lisa's daughter sparked the idea for a stylish yet functional baby bag - The OiOi Messenger bag was born! Australian designer OiOi takes the fashion shapes and colors of the current season in handbags and creates practical yet sophisticated diaper bag designs that are tailor-made for every new mother. The word "Oi" is a ubiquitous term used in Australia to attract someone’s attention...the Aussie version of "hey you!". Hence the designer penned the name in an ironic twist as she felt the bags were certainly "attention grabbing" as a stylish accessory yet, "incognito" as a diaper bag. OiOi Baby bags are stylish, innovative and practical bags known for their superb quality and reliability. The bags are loved for their spectacular designs, vibrant fabrics, and functional styles that have no comparison. Sprouting from a single bag in 1997, the collection now resembles a lively, bustling family with over 40 styles available. OiOi bags have led the way for over a decade and are THE original and essential style accessory that mother's throughout the world love almost as much as the little ones themselves! OiOi has continued to evolve, expanding from an Australian owned and designed brand to an internationally recognized label since first launching OiOi in the UK in 2002 and the USA in 2003. The company's continued success in an increasingly competitive market is a result of Lisa's knowledgeable background and ability to combine new season fashion with functional and innovative designs.